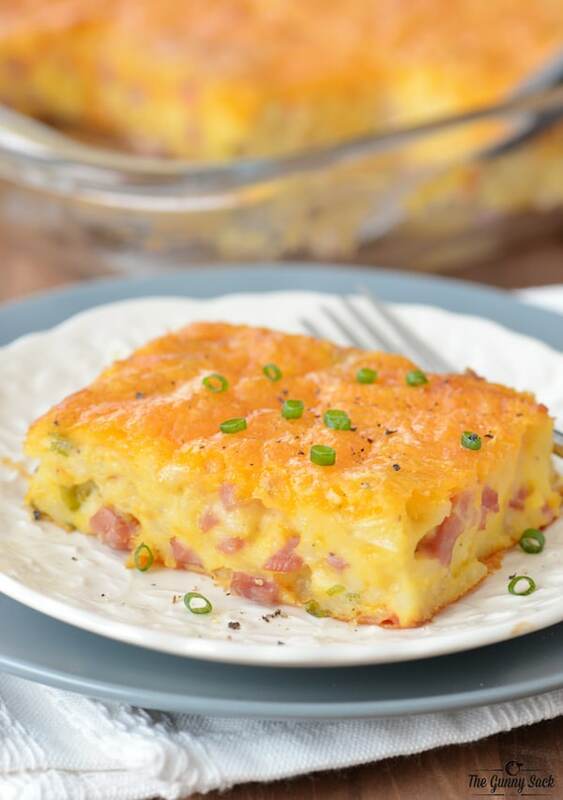 A Ham and Potato Breakfast Casserole is perfect for breakfast or brunch. 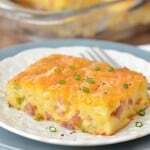 This easy egg bake recipe includes ham, potatoes, cheese, and Bisquick! Our plan for Easter weekend this year is to visit our friends in South Dakota. 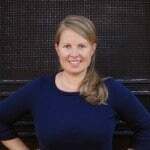 We will spend our time visiting, going to church and, of course, eating lots of great food! It has become a tradition that when we go to their house, the guys cook everyone made-to-order omelets for breakfast one of the mornings. Since Easter morning will be busy, we will probably have omelets on Saturday morning and breakfast casserole on Sunday. 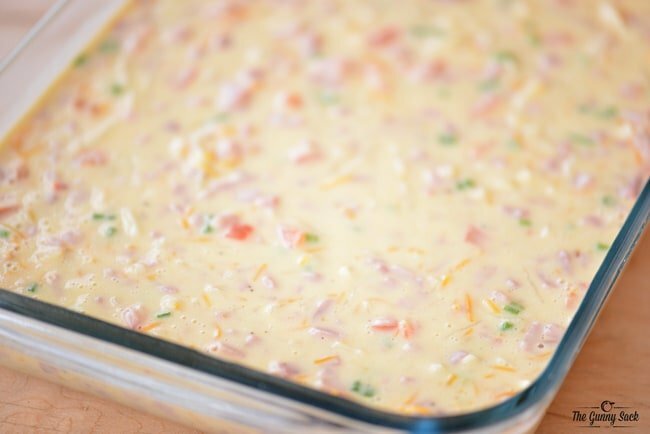 Today I’m sharing an easy Ham and Potato Breakfast Casserole recipe that would be perfect for Easter brunch! Heat milk and butter just until it starts to boil. Remove from heat and whisk in the cheese sauce mix from a package of julienne cheese potatoes and black pepper. 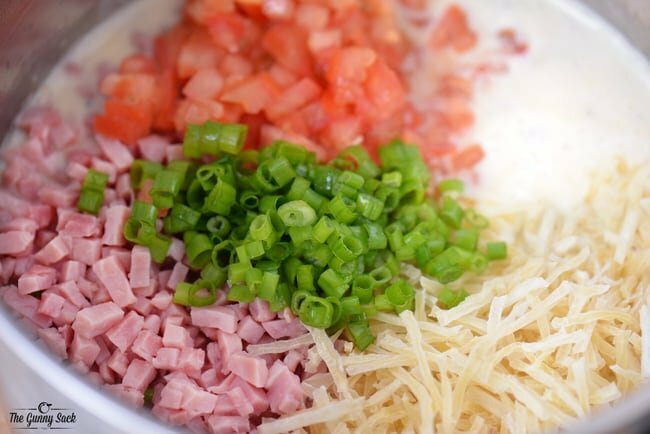 Stir in cooked, cubed ham, diced green onions, diced Roma tomatoes and the julienne potatoes. 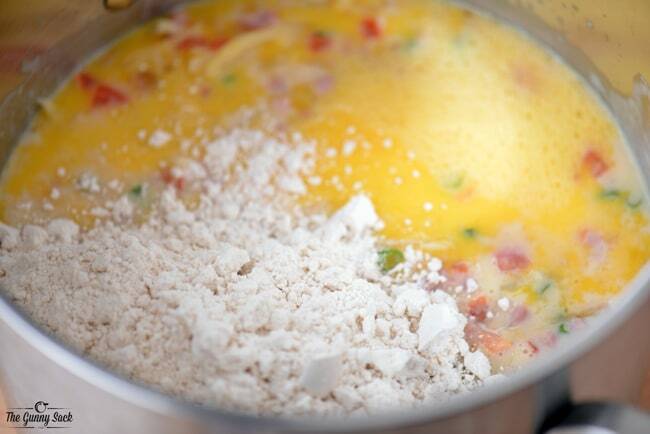 Stir in the Original Bisquick Mix, eggs, and a cup of shredded cheddar cheese. Sprinkle with a cup of shredded cheddar cheese. Bake at 375 degrees for 35 – 40 minutes. Garnish with additional green onions and a dash of black pepper. This recipe can easily be adapted to fit your family’s tastes. Go ahead and use what you have on hand. Ground sausage could be used instead of ham, the green onions can be left out of the recipe or chopped peppers could be added. 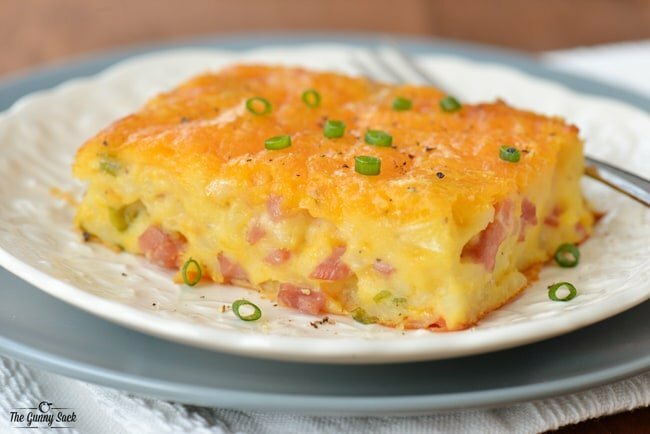 This Ham and Potato Breakfast Casserole is easy to make and it is a delicious way to start the day! Heat milk and butter just until it starts to boil, in a large pot, over medium heat. Remove from heat and whisk in the cheese sauce mix from the julienne potatoes package, and black pepper. Stir in the Bisquick, eggs and one cup of shredded cheddar cheese. Sprinkled with one cup of shredded cheddar cheese.